The following was written by a reporter with Nanfang Weekend. The article was NOT approved for publication, but it has nevertheless found its way onto the Internet. The Flood Disaster at Shalan Town: A Tragedy From A Series of Mistakes. At 2:15pm, about half an hour before the flood waters arrived at Shalan town, the elderly Mrs. Zhao Guojin arrived at the Shalan Central Primary School to take her granddaughter Wang Mingming and her daughter-in-law's other daughter Niu Xinying home. As a result, they were safe. At the time, she warned a teacher but she was ignored. This was the fourth warning sign that did not raise alertness that afternoon. At that time, some villagers were already telling each other that the "water bank has opened." Some villagers went to the town government office to check for news, but there was no activity there and so they went away. They did not realize that it was a public holiday the next day, and some of the town government cadres had left early from work. There were only a few workers left, and they did not always pick up the telephone. At least three people from upstream called that office without effect. Since the start of this summer, there are many cases in which flood waters have caused problems in the Heilongjiang province. This was not a one-time-even in Shalan town alone. According to the Central Weather Observatory, there have been local rain storms in various districts, causing some farmlands to be submerged under water, bridges and roads destroyed, houses flooded and animals drowned. But these news did not cause anyone to think that special attention had to paid to tiny Shalan Town. Afterwads, our reporter established that Shalan town and the several villages upstreams constitute a blind spot on the radar map of the weather service. Prior to the flood waters arriving, neither the provincial nor national weather observatories mentioned that there would be heavy rains there. After the incident, the Central Weather Observatory recorded only 1 millimeter of rain in that area. As Zhao Guojin crossed the central bridge to the Central Primary School, it had not even started to rain in Shalan town. The water beneath the bridge was just a small flow. "If they evacuated at that time, the school children would be alive!" On June 14, this tiny old lady was still screaming to the neighbors in the middle of the street. A villager believed that when the flood water arrived the central bridge, the overflow to the side could not have been a lot. But when the crest arrived at a smaller bridge further downstream, the water was obstructed and backed up and the levels rose rapidly upstream until Shalan town went under. To support this point of view, the central bridge near the Central Primary School is about 10 meters over the water level, but the smaller bridge downstream is only 5 meters tall. When the reporter went to the scene, the small bridge had suffered significant damage with the iron railings being washed away. By comparison, the central bridge near the school was undamaged. Shalan Town used to be known as Shalan Ditch. It is on low-lying land, and someone people attritubed this to be the cause of the disaster. But Shalan Town is not the lowest point of the entire Shalan river, because the river water continues to flow further downstream until it joins the Mudanjiang. This land is not a lake, and there are no water holes around the school. By 2:15pm, the flood water had begun to arrive at Shalan Town. When Zhao Guojin took the two children to cross central bridge, the water had risen up to 20 meters below the bridge. Concerning the question of the flash flood coming in with a mudslide, the villagers said that even if it occurred, it must have been far upstream. The fact is that the water came from only one direction, and that is along Shalan river. The river is not dammed anywhere, so there is no question of a dam failure. The only thing that happened was water overflowing. Very quickly, water entered into the school. Liu Lifei of Class 2 in Grade 4 became the first child to escape from the flood. At the time, the father of a classmate Wang Junyu rushed to the school and told the teacher Jiang Xiuping: "It will be too late if we don't run for it!" Jiang agreed immediately and told the children to run for their lives. So Jiang was the first teacher at Central Primary School to react correctly. When Liu Lifei charged out of the classroom, the water was up to his ankles. When he got to the school gate, the water was at knee level. When he got to the central bridge, the water was up to his chest. Actually, Liu Lifei was going against the current. The water behind the school was not as deep. Even so, Class 2 Grade 4 was the most lucky group for making the choice. Only one student died, as Liu Hungda was crushed to death by a falling wall as he hid behind a store. June 1 was the birthday of Liu Lifei. He asked 10 classmates home to celebrate, including Liu Hunda. The latter gave him a crystal globe as a prseent. After the flood, the crystal globe was lost. In remembering all this, Liu Lifei was hysterically sobbing and sighing. On June 14, the reporter saw the name Liu Hungda at the funeral home in Ning'an City; he had been placed in the same refrigerated box as another girl. After the river water overflowed the banks, it proceeded northward. When it reached the school entrance, some of it turned west into the parade ground. This was not a fierce torrent. The other side of the school faced the river, where the rushing water went straight towards the school building. There was only one barrier -- the schoolyard wall. If this wall could hold off the water for a little bit longer, more children would have been able to get out and reach the two taller buildings 50 meters away. But this wall was too thin. In Shalan town, there have been recent complaints that the school that was built with 40 yuan per villager was situated in a low-lying area, that the school building was single-story, and that the walls were too thin (with only two layers of bricks instead of the usual 2-1/2 or 3 layers of bricks). Within a few moments, the flood water rose up and the wall collapsed. The Shalan river water breached the short 15 meter gap to the school building, broke the glass windows and rushed right into the classrooms. 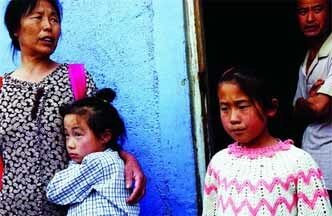 From that moment, Shalan Town became China's Beslan -- the parents rushed over to save their own children. They formed teams by holding hands and they stepped through the flood waters that reached their chest. They screamed out the names of their children, but not everyone got an answer. When they first stepped into a classroom, everyone had the same experience -- their feet seemed to touch something and then they reach for it. It was the cold body of a child. Most children died inside the classroom, with their book bags and stationary. Up until June 14, we can still find their belongings in the classroom: their drawing papers, their parent contact cards, photographs of the June 1 performance show, candies and exercise books. There was a tiny yellow shoe, only about the length of a finger. There are many hand prints left on the walls of the classrooms. Some are large, and were left behind by adults afterwards; in many other places, there were many small hand prints. The higher watermark was almost up to the ceiling by the highest glass pane in the window. There were 22 students in Class 2 Grade 3, but only two died. According to the girl Song Ningning, their teacher Li Rong asked them to stack up the tables and chairs, get up on the window sill, break the glass and sit on the highest window frame. The children were crying, but Li Rong told them: "Don't cry, don't scream. The water will go down soon." The survival ratio was highest in those classes in which the teachers stayed with their children and did not abandon them. Only one child died in Class 2 Grade 5. Teacher Wang Jinhuan and two parents broke the window class and handed the children up to the roof one at a time. According to the memories of the girls, the boys in the class were unbelievable. On June 14, when female student Zeng Lingling and other girl were examined at the health clinic, they told our reporter: "We were all pulled up to the roof by the male students." In the class with the youngest children, there was only one teacher in the classroom. The female teacher had rejected Zhao Guojin's recommendation to let the children leave. Although the teacher tried to help her chilldren, she did not succeed. The scene that the parents saw was that the children were dead inside the classroom, but the teacher was sitting on the window pane in the corridor. Another teacher was found by the parents perched on the roof of a residential building outside the school, while holding a piece of clothing. When parents Wang and Zhao wanted to charge into the first-year classroom, they were surprised to find something inexplicable: one of the doors was tied with steel wires, and the other door was padlocked. On June 14, when the reporter got there, the backdoor to the first-year classroom had disappeared. The indications at the hinges suggested that it was broken open by force. Just after 3pm on the day of the flood, Wang and others broke down the door and charged into the classroom. They found dead children one after another. 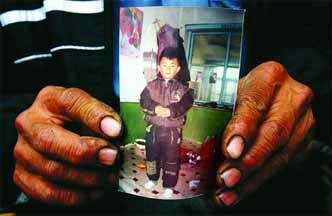 Zhang Wenhai found his eight-year-old son covered with cold mud underneath a desk. The local heavy rains began upstream, from Huoshing Village, Wangjia Village, Adan Village, Shekou Village and then Shalan Town. The party secretary and village director of Huoshing Village and the party secretary of Wangjia Village all tried to call the Shalan town government and police stations to raise the warning, but they could not avert the tragedy from happening. Shalan town cadre Wang Qingdao received the warning call from the Wangjia Village Zeng Chanhui, but said that he was the only person in the office and he could not do anything. Then he hung up. When Zeng called again, nobody picked up the telephone. Zeng also tried calling the town government many times, but no one picked up. The Shalan Town party secretary Huang Mingjun missed the news from upstream and lost his chance to save both Shalan Town as well as his own reputation. After a special team was set up to investigate Huang Mingjun, the villagers revealed their intense negative opinions about him. A 42-year-old villager Wang whose son died said that this party secretary does not care about the people and he has only done three things in this three years at Shalan: a fire, a construction incident and a flood. In 2003, Huang was transferred to Shalan. The next year, this tall party secretary was criticized by Beijing for the fire that the villagers mentioned. On May 1, 2004, Xinhua reported: "On April 26, a fire occurred in village house in Heilongjiang province Ning'an City Shalan Town resulting in the deaths of three people. According to the fire department of the public security bureau, this shows that the fire department did not have the right safety procedures in place. The inadequacy of the safety system was the principal cause for this disaster." Concerning the town police, the villagers were even more angry. The villagers told this reporter that the person who received the warning phone calls that they don't have the people. "It is beyond our power to do anything." A lot of villagers said that the people at the police station are usually busy issuing fines to unlicensed motorbikes. "Each time, they fine us 200 yuan. After fining us, they require us to get the registration When we get there, they make up excuses not to give it to us, so they can fine us another 200 yuan." The worst part was that on the day of June 10, several parents tried to go to the school on motorbikes to get their children. But the police stopped them and would not let them go through until they issued the fines, thus delaying some parents who were trying to rescue their children. According to a report on the investigation of the performance of the police as supplied by the deputy director of the Ning'an Public Security Bureau, the above assertion was indirectly verified. On June 14, the Beijing News reported: "Concerning the improper actions described by the masses, the report showed that the principal reason was the police was looking for unlicensed motorbikes, and therefore did not arrive at the scene of the incident in a timely manner." That evening, some villagers were still holding on to their muddied dead children in the water. They asked the police station to allow them to rest the bodies there. They said, "Your police station is at the highest point of the village. Or would you want us to throw the bodies back to soak in the water?" One police officer tried to stop them, but they pushed him aside and broke the windows. The police station is four stories high and built at a high point. There are steps in front of the door. So this was definitely one of the few buildings in town that did not take in too much water. But the real reason why the villagers did it was that they were angry -- according to local customs, to deliver a body to someone's place implies a strong condemnation that the person bears some responsibility for the death. Based upon the distance of the river, the villagers estimated that Huoshing Village is 20 kilometers from Shalan Town and it would take 2 hours for the flood waters to reach here. For the school children, there was enough time to make it out. The villagers were dissatisfied with the bureaucratic behavior of the village organizaitons. On June 12, the leaders of the Heilongjiang province, Mudanjiang City and Ning'an City governments met with 10 representatives of the victims' families. The representatives said, "The flood was an act of heaven that cannot be avoided, but the man-made disasters must be investigated." At this so-called negotiation meeting, the Shalan Town Water Works Department director Liu Mingguang explained to the leaders and the people that the floods came because the villagers were cutting down trees and despoiling nature. The victims' representatives counterattacked: "There are people who cut down trees. But would we villagers dare to do so? Could we?" The representative walked out of the meeting at one point. A Ning'an leader then tossed Liu Mingguang out of the meeting in order to go on. The villagers explained that these are the kinds of talk that disgust them, for it represents the thinking of the town officials. They were happy to hear that the town party secretary and the police director have been "arrested." "Those children had the chance to live." Zhang Haixia's son Jia Zibo died in the Grade 2 classroom. She said, "If only one person in charge had said something, the 100 plus children would have had the chance to live." In Grade 1 classroom at Shalan Central Primary School, the person who could say "something" made the final wrong choice. Zhao Guojin repeated her story. At around 145pm, she entered the Grade 1 classroom and yelled out, "Teacher, call the class off now! The water has broken open!" The students were stunned by her voice and tone and started to "cry." Zhao Guojin took her two kids to leave. She looked around and saw her neighbor's daughter Sun Lei. She said, "Sun Lei, you come home with me." At that moment, the Grade 1 teacher did what teacher are supposed to do even as she ignored the seriousness of the warning. She used her ruler to bang the desk and said in her normal way, "Sit down! Sit down! Nobody leaves until their parents come!" The teacher did not ask Zhao Guojin what the matter was. Zhao Guojin did not warn the other classes after she retrieved her own children. Forty-six children remained in the Grade 1 classroom. Except for one girl, all the others drowned, including Sun Lei. 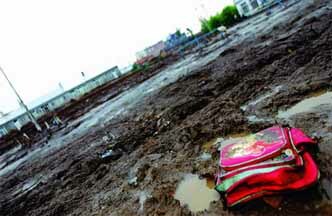 On June 13 and 14, there was mud everywhere in Shalan Town. The walls recorded the watermarks of various heights. People looked depressed. Cars were going back and forth through the mud to clean, search, sanitize and supply. There were policemen every 10 meters or so. The police dog teams from Jixi were stepping through the mud, and the dogs looked fatigued. On June 14, the officials delcared that there were still 18 missing (including 10 students). The number of dead is 99, including 95 students. Shalan City lost about one-third of all its children. The social attitudes in town are changing, as both hatred and numbness grow. More commonly, people ignored the heroic acts during the flood and focused on the cowardice instead. When the flood arrived, English-language teacher Fu Juan did not have class that day but came to retrieve her own children. But she stayed behind with the Class 2 Grade 4 and led the children out of the school grounds. Liu Heilong and other parents led their own children and then continued to help others. Our reporter eyed the watermark in the classroom, and saw that the watermark reached near the top of the blackboard to at least 2.3 meters high. The adults had also beein in peril. Unfortunately, such instances are too rare. In the chaos, the official report on June 14 was that at least 100 students died in front of their classmates. The parents of the missing children have given up hope. On June 13, the fourth day after the incident, Wang Dequan only ate a boxed rice. He spent the day with the search parties; he was dead tired and he slept in his clothes in an emergency field tent. He had no great dream beyond finding the body of his child. "I just want to take a look," he said. He did not cry, but he felt dazed. Du Mingyue's family lost two children and Xing Yunshiong's family lost a child and an elder. At the Ning'an City funeral home, an old woman cried that her family lost three children. Her daughter prevented the reporter from asking for more information. The parents are not satisfied with the toll figures released by the officials. In the first couple of days, they got emotional. Even now, they are still suspicious but they have not been able to come up with any hard evidence. Most of the children were deeply hurt, and did not want to remember the situation. On the afternoon of June 13, there was another rainstorm in Shalan Town. Song Ningning was scared witless and dragged her mother to run towards the high ground. Children sometimes wake up crying in the middle of the night. When Shalan Middle School re-opened, the students do not dare look towards the Primary School when they get out. The only exceptions are the few students who did not attend school that day, or were retrieved by their parents beforehand. On the second day after school re-opened, Wang Mingming and Niu Xinying walked down the street with their grandmother, and they were striking for their carefree manner. On the afternoon of June 16, the grandmother of Gao Lulu raced over to embrace Wang Mingming in the street and started to cry. She knelt down in the mud and cried. Zhao Guojin explained, "Her granddaughter was in the same class as my granddaughter. When the female health workers from Mudanjiang City heard Zhao's story, they told her that she was "smart" and she "did good," Zhao felt proud but then she started to cry too. The hurt in the villagers was inestimable. In the funeral home, Ying Yanmin held her daugher Wang Ying's photo and cried: "My daughter was dragged out of the mud! My daughter died unfairly!" Facing our reporter and the Shanghai TV reporter, she condemned the town leaders, the police and the teachers. Wang Ying was 7 years old, and in the Grade 1 class. On 230pm on the day of the inicdent, the health clinic director, Xie Hongquan heard a middle-aged woman yelling, "The water has overflowed the bridge!" He went out to look and saw that the front of the school was covered with water and impassable. He sent out the health workers and telephoned the city health department. One hour later, he finally called a call from the town government, "There are casualties." At 330pm, the first child was carried into the health clinic by the parent. The child was covered in mud, and felt cold by touch. The child was already dead. From then on until the night, children were brought in in twos or threes to the health clinic. The sick beds were quickly filled. The parents tookd the equipment off the tables and put the children on them. There were dead children everywhere with no place to put them. A chair can hold one. The little table can hold two. At around 4pm, someone yelled, "Director Xie, your own child is here!" After saving another child in convulsion, Xie went over to look at his own child. He told his wife, "It's over." The wife refused to accept and made the health worker continue the effort. When the ambulance came, the wife took the child to the city hospital. It was a characteristic of the town women that they refused to admit that their children were dead. The arrival of the flood water caused electricity service to be disrupted in Shalan. The mobile phone signals were also lost. That night, the health clinic used candles which shone on the dead children everywhere. Liu Yuxin was the only surviving child in Grade 1. She could be said to be a child blessed and kissed by fate. She is 7 years old. When the flood swamped the classroom, she was struggling in the water along with her classmates. Miraculously, she grabbed the hot water pipe and she was able to climb up the window sill. She was able to hold on in the swilling water without letting go. Even when the water rose above her head, she only gagged a couple of time. She stood there in chin-deep water for an hour before the water receded. At some time after 3pm, her uncle charged into the classroom and started searching among the the children in the water. At that moment, Liu Yuxin called out from above, "Uncle, what are you looking for? I am up here." Amidst all the floating corpses belonging to children, this was one happy ending. But while the little girl was calm and collected, the uncle was the one who started to cry aloud. Related post: The Shalan Flash Flood - Part 4 This journalist published his field notes to tell about what he could not include in this article.